The UK Independence Party has lost one of its two London Assembly members to Robert Kilroy-Silk's new political party, expected to launch on Wednesday. 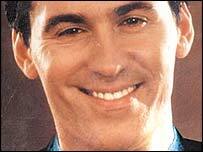 Damian Hockney said ex-chatshow host Mr Kilroy-Silk would "deliver better" as the leader of a eurosceptic party. He said Mr Kilroy-Silk had made him deputy party leader of Veritas, Latin for truth. Sources close to Mr Hockney said around eight other members of London UKIP were also planning to jump ship. Details of the coming week's events were hammered out at a meeting at Mr Kilroy-Silk's Buckinghamshire home on Sunday, the BBC News Website was told. The news came after UKIP suspended a candidate for allegedly suggesting the criminally insane should be killed. John Houston, 54, was due to stand in the East Kilbride seat in Lanarkshire at the next election. A spokesman for UKIP called on Mr Hockney to quit the London Assembly. UKIP asserts that Mr Hockney "has a moral obligation, if not a legal one" to stand down. 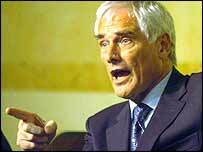 Mr Hockney meanwhile told the BBC: "I believe that Robert Kilroy-Silk can deliver better as a leader of a eurosceptic party than the current leadership of the UK Independence Party." On the suspension of Mr Houston, UKIP said those who selected him knew nothing of his views. UKIP spokesman Mark Croucher said the main issue would be that Mr Houston's reported views had been presented as UKIP policy, which they were not.